One of my favorite techniques when creating compositions is the ability to give a composition a “textured window” – a portal – that introduces someone looking at my artwork into my world. I also tend to use textures with color as a basis for compositions. Textures can also be used to unify seemingly disparate elements in a composition. They can be subtle or they can be dramatic. Photoshop CC not only makes this process easy but also fun to explore your creativity. This guide is a look into how I use textures in my workflow. Hopefully, you’ll pick up something new or feel inspired to make your own textures. These tips assume you know the basics of Photoshop – namely, the use of layers and blending modes. Included in the Warunicorn Collection are high-resolution textures for Parchment Paper, Coffee Filters, Construction Paper, Tea Filters, Facial Tissue, Contractor’s Paper, Ice, Paperboard, and more. 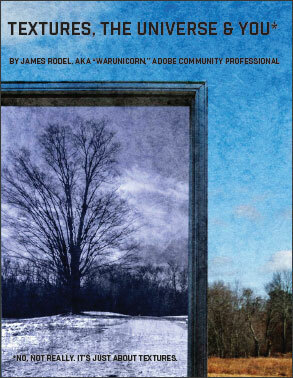 Add textures to your images with this great new panel for Adobe Photoshop CC. Included with this panel is a wonderful sampler set of textures from Fly Paper Textures. You can also add your own custom textures for even more creative possibilities. Check out the complete guide to all the features added to Photoshop in all CS and CC versions. Do you have any questions about textures in Photoshop? Just ask them below and we’ll get you answers fast! Both of these sets are great. Hey, these are cool, and give some nice ‘painterly’ effects. Appreciate everything you do on your blog to support Adobe users! Do these work with Elements V13? Yes, they should indeed also work with Photoshop Elements, or any version of Photoshop. In the simplest use, it would work the same: add a new layer above your photograph, load the desired texture into that layer, and then set the Blending Mode and Opacity per your creativity. Is there a way to import these into Elements so that they are part of the quick pallet on the side. Right now there’s 10 preinstalled borders, 10 preinstalled textures. It’d be great if we could import textures or frames into this quick pallet. Is it possible? I downloaded a folder that was supposed to be 213 MB and contain 83 textures. The file I received was 213 MB but only contained 29 zipped files. I unzipped them and have used them. Now I would like the other 54 textures. The other 54 textures come with Paper Textures Pro, which is also free, and discussed in the second half of the post above. I don’t know if I’m the dumbest person on the planet or what, but no matter what I do, I cannot figure out the steps to install whatever it is I need in order to get access to the “supposedly” free flypaper textures that are “supposedly” free if I have a paid CC subscription. It’s like the feedback loop from the insane asylum. One time I actually arrived at a link with the actual flypaper textures, but they were not free. They had to be purchased. Has anyone found step by step instructions for getting the add-on or extension or whatever and been able to access the paper textures? It can now be found via this link. The article above has been updated to reflect the new location, and we apologize for the inconvenience.